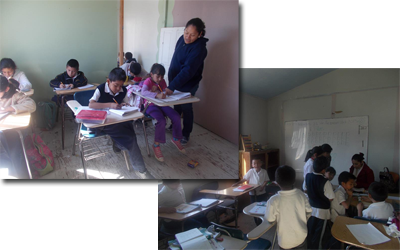 The students of la roca have not had official classrooms for over 6 months. Some areas of the classrooms were removed due mostly to mold issues. With the work going on it has made the one remaining, small, usable area unsafe for the children. Thus, they have been meeting in other areas around the La Roca property. The work is slow due to constrained financial resources. Foundations have been poured, and plumbing has been installed. The current task at hand is moving in dirt to get the area ready for concrete. Moving dirt is expensive at La Roca. Because of the way the school is situated on the side of a hill and the difficulty of finding good dirt, makes it a very teadious and expensive process. But it is moving along. Once they are out of the dirt stage, things should pick up pace. Here in the United States, projects linger for months in the dirt stage and they usually have financing already arranged. Down at La Roca they move by faith and a shovel of dirt at a time, hoping for another truck load of dirt. If you would like to help, you can go down with the rest of the Foothills mission team on the third Saturday of the month. Contact Scott Tulloch at 468-3616. La Roca also needs financial donations to help purchase material. You can send donations to the church or drop them in the offering plate on Sundays.